Mary Jordan often has a full day: train to become a Paralympian, and fight multiple sclerosis. Jordan is hoping to fulfill her dream and qualify for the 2016 Rio Paralymics in dressage, an equestrian sport that resembles a type of "horse ballet," she says. 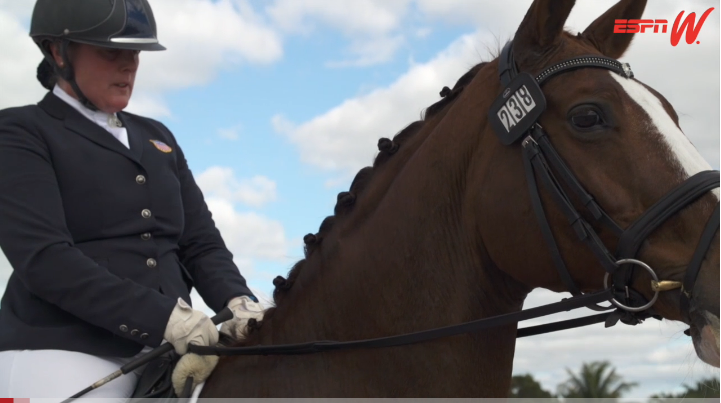 Jordan balances her job at Panera Bread -- splitting time between her home in Maine and a training facility in Florida -- with working to stay fit and perfect her routine in the dressage arena. She's also using the sport to fight MS, an unpredictable and chronic central nervous system disease that she was diagnosed with in her late 30s. The disease can sometimes leave people immobile for life. Symptoms -- such as blurred vision, loss of coordination and difficulties with mobility -- arrive randomly and last for unpredictable periods of time. On tough days, Jordan says it's dressage that helps her get out of bed. Jordan grew up caring for her father, who also had MS. And these days, she wears many hats -- she's a mother, a wife, a caretaker for her horse, an athlete and a survivor. Besides fulfilling her dream of competing in the Paralympics, one of her main goals is to show her son that MS doesn't have to debilitate you. "I'm hardwired now, I won't give up," she says. "I will never give up."